Systematic trial-based learning procedures are commonly used to teach students with disabilities in special education settings. Instructive feedback is a procedure created to increase the efficiency of trial-based learning procedures. It involves the planned addition of non-target information that is systematically placed in the consequent events of learning trials. This systematic review examines the instructive feedback literature that was conducted since the only previous review was published in 1995. An extensive search of published and gray literature yielded a total of 54 eligible studies. Across studies, participants acquired an average of 64% of the non-target information presented through the instructive feedback procedure. In group studies of instructive feedback, participants exhibited an average gain of 55% of the extra information provided to peers. Results suggest that the instructive feedback procedure can be used to increase the efficiency of trial-based learning for students with disabilities of all ages. 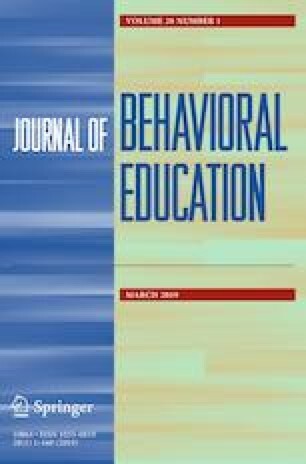 Instructive feedback is recommended as an effective strategy for enhancing trial-based teaching procedures for students with disabilities.